MORRISSEY His Master's Voice Promotional Photograph (Rare official 1991 His Master's Voice UK promotional publicity photo, a classic black & white live Moz image by photographer Kevin Cummins, measuring 10" x 8" - This original vintage publicity still is printed on high quality Kodak photographic paper and features a glammed up Morrissey perched on the stage monitor, the image taken from his solo debut performance in Dublin - perfect for framing and display) * Please note - this is an ORIGINAL publicity still distributed by the press office. It is not a copy. Copyright remains with the copyright owner and must not be reproduced without their written permission *. 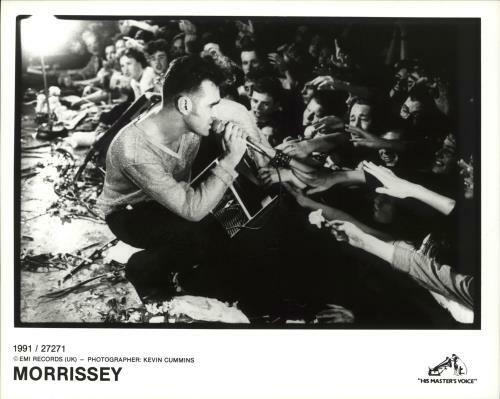 or visit our Morrissey image gallery.